Find Out Who'll Shop With Cosmo Editors In Hong Kong, PLUS: HK Shopping Tips! We've selected the two lucky readers we're flying to Hong Kong for an all-expense-paid shopping extravaganza! Find out who, and read up on the Hong Kong fashion scene. Here at Cosmo, we're all about taking risks and going for what you want. Which is why we gave our readers a chance to win a FREE trip to Hong Kong for a fabulous international shopping competition! For the whole month of July, we asked you to submit your entries telling us, "What's your fashion-forward style tip for Hong Kong visitors this summer?" for a chance to represent the country at the Visa go Hong Kong Super Shopper Promo. We're super grateful to all Cosmo readers who showed off your Cosmo style skills with your great answers, but we can only take TWO of you with us on our shopping spree. Well, we're sure you're all excited to hear that raffle results are in. And the two lucky ladies are: Jacqueline Antonio and Gianina Mae Gono! We loved Jacqueline's insightful tip: "Summer is a great time to play with colors and prints...Simple look, comfortable, and maaliwalas feeling will do for a summer trip in HK, and most of all the best accessory—smile!" Gianina's practical summer advice is to "Wear statement-making accessories with a light dress." You'll both get to put your tips into action from August 29 to September 1, 2011! We hope your style senses are tingling because you're about to go on the shopping trip of a lifetime! The two girls make up the Philippine team, and will shop for great fashion finds with a budget of HK$20,000 Visa spending credit per team. They'll be competing against teams from other countries to create the most fashion-forward Hong Kong look. Each team will be assigned a shopping mission based on a fashion theme for this season, and they're required to interpret their given fashion theme to create a new summer look by mixing and matching different fashion items purchased during the contest. They'll be required to shop for fashion items for two outfits, including clothes, shoes, accessories, and cosmetics, one for each team member, according to the assigned shopping mission and within the given time frame. And the prize for the team that scores the highest points in the competition? A whopping HK$200,000 Visa spending credit! Excited yet? We're sure you can't wait to get packing but, before we leave, let us first give you a little peek at the fashion scene in Hong Kong (which will also help Jacqueline and Gianina plan their shopping strategies). Click on to the next page to read our Q&A with a famous Hong Kong designer and cop some tips on how to master the Hong Kong style! Last month, Cosmo visited famous local designer Ranee Kwok for a little chat about what makes Hong Kong style special. The young designer, who studied at Parsons in New York and interned with famous designer Donna Karan, had some interesting things to say about the unique way Hong Kongers dress up! How would you define Hong Kong street fashion? A lot of European trends, and also I think Japanese and Korean fashion have a lot of influence nowadays, especially for the very young people. And then there's some niche people—they love to go to individual designers. Some of them would even do DIY stuff; I think this is something I would like to see more and more. What differentiates Hong Kong style from that of other Asian countries? I would say Hong Kong people are very detail-oriented. Even though they wear something very simple, they may match it with some chunky accessories or big sunglasses. And people in Hong Kong, they love hats, too. Maybe five years ago, I wouldn't see that many people wearing hats. I think this is a very good trend because I love hats and hair pieces! How do women in Hong Kong usually dress for summer? They are quite bold in their fashion sense. I see lots of different styles. This season, color-blocking is so on trend, lots of neon-colored stuff. I love people wearing colors, I think it really brightens up the day. Big patterns, big things, and vintage fabrics [are also popular]. For cuts, mini would be what I like because this is summertime. It's better to have something easy, and to show some legs is good. What are five things every woman should have in her closet? 1. A simple dress. A lot of people will say a black dress, but I think the color's up to the person. To me, it would be a simple red dress that doesn't get wrinkled easily. 2. A well-fitted cheongsam, because you can wear it to different occasions. It wouldn't make you too dressed up or dressed down. 3. Accessories like big rings and bangles, a classic pearl necklace, and sunglasses. 4. A nice scarf—it's always good to have a scarf because it can be a part of your fashion and it can also protect you well in different weather. 5. Some well-fitted pants. Once you find [the perfect pair], you can make 10 or 20 of it in different colors and different fabric combinations. Where can the most fashionable people in Hong Kong be found? Everywhere. Definitely in the Soho, Noho area around here, 'cause they have lots of little shops, and they offer things that don't look like what anyone else owns. Also in Mongkok, I would say. You can find the latest version of sneakers and sportswear there. And also why not go to The Landmark island? You will see different types of lifestyles; they are more relaxed...very trendy, as well. 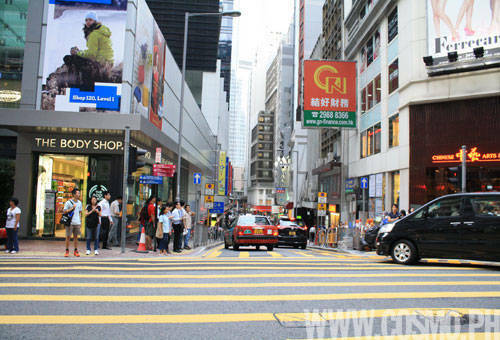 But if you want to see the shops, definitely Noho, Soho, Central, Causeway Bay. If you want to find big brands, you can go to Landmark, IFC, all those big shopping malls. How about for people on a tight budget? Oh! Very easy! We have lots of chain shops like H&M and Zara. You can go to Stanley where they sell lots of cut-label stuff. Mix and match stuff. Find old pieces and match them with the trendy stuff. My tip is, don't throw away old stuff. If you have the space, of course. What tips can you share with our readers when shopping for that perfect dress? When shopping for outfits, it's important to try on stuff, wear the fabric, and see how it feels and falls on you. Then, you'll know. A well-fitted dress is something that's not loose, not tight. Get something structured, which you can dress up or down, just by adding and mixing with accessories. If a Filipina wanted to fit in with Hong Kong fashionistas, what would be your tips for styling her? What looks good on others [may not] look good on you, so I think you still have to know yourself, to wear something that is comfortable to you. But maybe try to find some special shoewear, accessories, little things... They're instant conversation starters. As long as you can present yourself well, I don't see boundaries. It's hard to say what is more Hong Kong. It's not about the clothes or the style; it's about your own confidence. Some people are very bold, some people a bit shy. But keep an open mind because you never know what can be good on you if you don't try it on. Go on to the next page for our guide to some of the must-visit shopping centers in Hong Kong, and what you can find in them! In Ranee's boutique, you'll find all sorts of quaint items that have a story to tell. She specializes in reworking vintage clothing into something modern—with an Oriental twist. If you're fond of retro prints, quirky cheongsam dresses, and antique accessories, you'll love the collections she's created for her individualistic customers. IFC houses many high-end fashion brands. Some highlights include the Tom Ford store (one of only two branches in China) and Agnes b. LA LOGGIA (the first-ever Agnes b. flagship store in the world, comprising sections for women's wear, menswear, sportswear, beauty, jewelry, travel, and even a restaurant and chocolatier!). If you want a one-stop place to spend lavishly and enjoy yourself, this is the place to do it. Described as "The World's First Art Shopping Mall," K-11 is a quaint space that exudes creativity and imagination. From the outside display of cartoon figures and a Mona Lisa mural made entirely of toast to the amusing K-11 design store, this is where artists and the young-at-heart go for their shopping, dining, and entertainment needs. You can find casual wear like Levi's and Miss Sixty shops, as well as designer brands like local ready-to-wear art label Gay Giano and French accessories brand Longchamp. Offering 25 floors to shop in, The ONE is the tallest retail complex in Hong Kong. Inside you'll find an eclectic mix of Asian and European styles, with a large number of exclusive stores and local cutting-edge fashion labels under the I.T group, as well as Japanese brands like Lovedrose and Beauty & Youth. In addition to fashion, there are floors devoted to home furnishings, a grocery, and a multiplex cinema. If you get the chance, we suggest you explore the restaurants on the upper floors—the view of Hong Kong from that height is nothing short of breathtaking. For some intense retail therapy, visit this massive shopping complex that is connected to other major buildings by a pedestrian bridge. The easy access allows you to leisurely explore different luxe brands like Fendi, Dior, Tod's, and Harvey Nichols. The strong ties between Hong Kong and European fashion is also seen in special exhibits like last month's "Homage to the Italian Flag: Interpretations and Expressions of Style," which featured work by esteemed Italian fashion houses like Missoni, Max Mara, and Roberto Cavalli. Launch the gallery to see photos of these (and more) must-see shops in Hong Kong!